THE DEMISE of patentability of software in the United States is mostly being ignored by the USPTO, which prefers to ignore what courts are saying and carry on issuing software patents. The same thing has been happening at the European Patent Office (EPO) and we shall get to that in a moment. There’s a bit of a “shared struggle” on both sides of the Atlantic, impacting software developers in Europe and the United States. If the U.S. Patent and Trademark Office carries issuing all those abstract patents — as does the EPO — what will be the impact on presumption of validity of US and European Patents (EPs)? This is a key question which is increasingly being raised by technology-centric groups. “Iancu, the current Director of the USPTO, has been acting like the patent trolls’ mole or at least their apologist.”“Try the Newly Upgraded Anticipat to Complement Your Patent Prosecution Practice,” Anticipat wrote a few days ago, ousting itself for what it really is other than an anti-PTAB ‘tank’ (or propaganda mill); it just targets trolls and prosecutors looking for people to blackmail. They know that their chances in courts or in the Patent Trial and Appeal Board (PTAB) are rather slim and therefore they try to assess risk and cost (an appeal to the Federal Circuit can be rather expensive, perhaps requiring millions of dollars set aside for legal bills). “Harness the power of patent analytics to make better-informed decisions using the power of aggregate appeals data,” they said. They’re not alone in this ‘business’ (of litigation). Sadly, however, today’s leadership at the USPTO sympathises with them. Neil Wilkof has just published something titled “The IP term (thus far) of the millennium: the curious story of the adoption of ‘patent troll’ and ‘internet trolling’” in which he cites the father of patent trolling. Well, first of all, there's no such thing as "IP"; Wilkof could at least correct this misleading terminology and speak of patents instead. The only thing a “patent troll” and “internet trolling” have in common is that they engage in nothing constructive, just harassment. That’s the “teach the controversy” propaganda line; if a patent troll is defined as a firm which practices nothing but lawsuits, then the existence of it is not disputable; it is measurable, too. The name used to describe it may vary (used to be “shark”), but this phenomenon is very much real and it is extremely problematic. With words like “inventors”, “discoveries” and “monetize” it is hard to take this discussion seriously; most patent trolls use software patents, so we’re speaking of algorithms (programming, not inventions) and much of the ‘research’ that favours trolls is sponsored by the usual suspects. For about a decade now we’ve been arguing that one effective way to combat patent trolls is to eliminate patents on software. At the moment such patents are being granted, still; they’re not of much/any use in court, but they’re being granted in order to fake production and bring more revenue to the patent offices. Let’s start with the EPO as our case of point. As Poland turns 100 the “EPO congratulates Polish patent office on its 100th anniversary” (the EPO published this (warning: epo.org link) on Friday just to peddle some fluff/puff pieces); at the same time EPO corruption ruins ILO/ILOAT which are about 100 years old. Campinos frequently promotes software patents in Europe (under the guise of “AI” and other buzzwords). “The Official Journal 11/2018 is now available online,” the EPO wrote in Twitter on Friday; it has mentioned (warning: epo.org link) the EPC, which is routinely violated by the EPO. Who benefits from this? It is worth noting that Kate Gaudry and Samuel Hayim wrote in Watchtroll a few days ago that “[t]he stark reality appears to be that artificial intelligence technologies are likely to be more heavily scrutinized under 35 U.S.C. § 101 and less likely to be allowed.” (the article’s headline is “Artificial Intelligence Technologies Facing Heavy Scrutiny at the USPTO”). They call them “AIpatents”; that in its own right is quite a buzzword. Corporate media nowadays calls just about everything “AI” (even hardware that’s marketed this way); Nowadays everything is being labeled “AI” provided it does something ‘clever’; sometimes it’s exploited to get bogus patents that are software patents and associate them with “health”; Sometimes the patent law firms can just be replaced with some piece of software, whereupon this buzzword is again invoked; how about this financial context? These are all examples pertaining to patents and they’re all from the past week alone. Earlier this week, on Monday, November 26, 2018, Andrei Iancu, Under Secretary of Commerce for Intellectual Property and Director of the United States Patent and Trademark Office, delivered remarks to the 10th Annual Patent law & Policy Conference at Georgetown University law School. 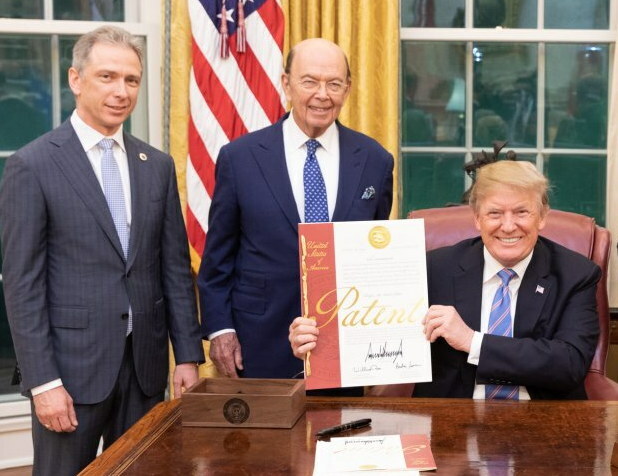 In his remarks Director Iancu again said what he has been saying for some time — the USPTO is working on fresh guidance relating to patent eligibility for computer implemented innovations (i.e., software related inventions). Director Iancu’s remarks gave a first look at what his reforms will look like, and by all indications these changes will be extremely innovator friendly.